An industrial office setting typically isn’t quiet, and usually isn’t pristine either. What it can be is a busy, active work space where employees demand a lot from the desks, chairs, cabinets, and even cubicle partitions that serve them. Cubiture has one of the widest selections of long-wearing, good-looking industrial office furniture in Houston. And because we’re experts with decades of experience, we can help turn a mismatched office – where everything shows signs of abuse – into a neat, orderly workspace that will hold up for years. In an industrial setting, the materials that workers contact all day have to resist everything that comes at them. If a shift leader has one of the biggest and heaviest coffee mugs you’ve ever seen, a laminate desk wont mar and wear under it the way that some materials will. Sturdy metals, including steel, wipe down easily. So they stay looking great for years instead of turning grungy in a matter of months. And if the occasional dirty boot leaves its mark on the leg of a chair, it won’t become a permanent fixture as the metal can be wiped down and show no trace afterward. Industrial settings are prone to dirt and grime. Even if the grit is supposed to stay in the warehouse or factory, it’s easy for it to find its way into the office, where it can damage upholstery and other soft materials. Tough, stain-resistant upholstery fabrics are vital for industrial office furniture, because when you can clean up a mess, even a coffee spill, your upholstered furniture will keep its good looks much longer. And when the upholstery does need replacement, as all of it ultimately will, let Cubiture refurbish it to make your chairs look new again. Hardly anyone tiptoes carefully through an industrial office. People move, sometimes fast. And where there’s a lot of activity, something’s bound to be damaged. That’s where strong construction makes a difference. You might find an attractive chair or partition at a discount store, but how will it react to heavy use and occasional bumps and bangs? Ask our experts at Cubiture for the most durable materials what we’ve got, and your office furniture will last without falling apart. Industrial office furniture doesn’t have to be a compromise. Of course you need it to handle lots of wear and tear without breaking down, because who wants to replace it all again in a year or two? But there’s also something to be said for an attractive office. Cubiture can help you find that middle ground where style and durability meet in the middle. 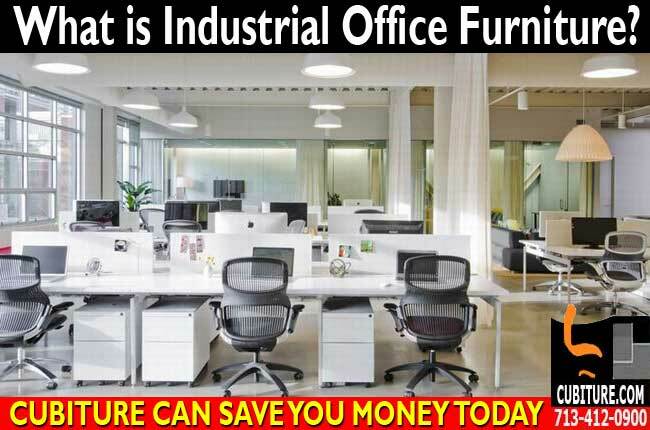 Give us a call at 713-412-0900 for a free quote and learn how Cubiture can help you outfit your industrial office with furniture that lasts. While you’re at it, ask about our complimentary space planning. We can help you design the most efficient space where your new furniture will work even better.